“…we can deduce that pop-ups must focus on experience to thrive.” We ended one of our more recent articles with this statement. A declaration that was as relevant the day we published it, as it is today. Not forgetting the importance of customer engagement and experience in pop-up spaces is G.F Smith. As part of their exhibition ‘Paper City’ – featuring installations from leading creatives in various Hull spaces – this year, the brand chose to celebrate the world’s favourite colour. It all started with an online survey, inviting thousands of individuals across the world to vote for their favourite colour. 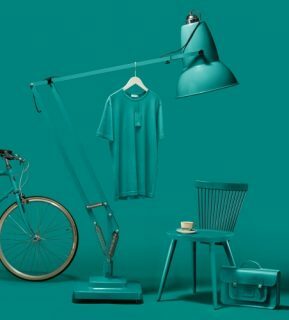 Once chosen, the colour would be applied to a whole host of products – from homeware to bicycles. And through this online platform, it was decided: Marrs Green. This was the world’s favourite colour. The results were not just emailed or revealed online. 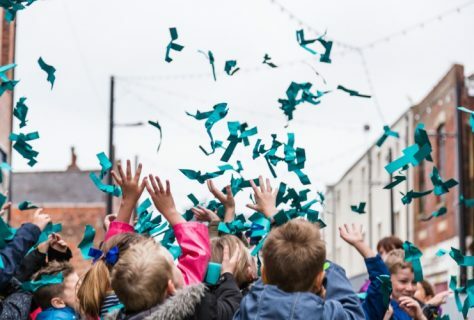 Instead, G.F Smith chose to create Marrs Green paper helicopters, shooting them out of canons from buildings on Hull’s Humber Street! Once revealed, Marrs Green would be most prominent in their pop-up shop, open on the same street, which sells iconic British products customised to this favourite colour. Open until 9th July 2017, if you’re intrigued by the idea of Marrs-Green-everything, Hull is the place to be. G.F Smith were founded in Hull, they have also been based in Hull ever since. The location for the Paper City event as well as their favourite colour pop-up shop is incredibly personal; promoting the heritage of the brand. Using the survey allowed for the greatest customer engagement, customizing products using the most loved colour across the world and present them in a temporary retail space – the most personalised pop-up ever? Amidst so many pop-up spaces from big brands – especially in London - an event from long-lived paper company in Hull may not have been high on the priority list. But it should have been, as it ticks all the boxes for a pop-up space. Not a bad note to leave on when considering the power of tactility and physical transactions in retail – something we feel pretty strongly about. Did you visit the big reveal in Hull – what did you think?